Looking to find free images ? Check out Flickr for creative commons images. Here is a screencast on how to navigate Flickr to find CC images ! Our educational guides are organized by category and title below. We also have the Fair Use app and 150+ video guides available. You can check out our video legal guides by clicking here! 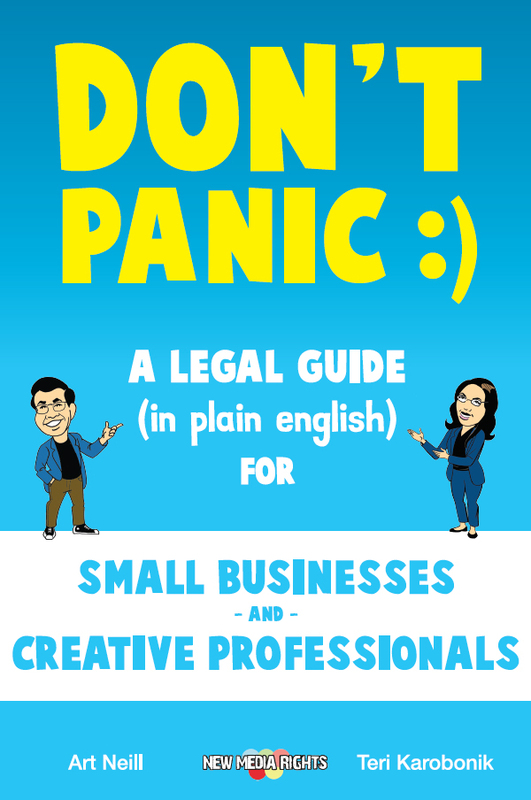 You can also buy our new book Don't Panic, a plain language legal guide that every creator and business should have when starting a project. New Media Rights Guides are available to browse, read and learn from. They are organized by category and title. New Media Rights' Pete Fuentes teaches the basics of jump cuts, match cuts and cutaways. The video is also an excellent example of fair use, quoting three scenes from famous films to illustrate practical examples. Original creativity, fair use, and creative commons = new creativity. Sometimes its hard to find music, images, and video that you can freely reuse in your own creative project without fear of attorneys or the FBI showing up at your door. This resource serves as a guide to find works by artists who WANT you to reuse and build upon their work. You can also check out our Creative Commons, Fair Use, and copyright guides to learn more about reusing and remixing content.